Tonight Im off to a Christina Aguilera Karaoke (don't ask!) with Zoe and this is what I'm going to wear. I decided on these velvet leggings from Topshop with stud detail. I thought they looked really cool and perfect for the colder months. I think they look dressy without being too much. For Topshop Petite they are actually a bit long on me which makes them go a bit bunched up at the knee's which is super annoying as I keep having to glamourously hoik them up! Paired them with my beloved Office Flatforms (which I haven't worn in ages!?) so I had a bit of height. I accented my look with some rose gold jewellery. Im not that into gold so Im happy to see more rose toned stuff on the high street these last few months. I'm especially in love with the Rose Gold spiked bracelet Black Tied kindly sent me! It's amazing and I've had so many compliments on it! Im probably going to layer up with a scarf and a leather jacket (possibly my fur!) as it's just so darn cold outside at the moment! I'm currently writing this from under my duvet and I'm dreading opening my front door to greet the outside world! I hope you liked the video I made to go alongside this post! 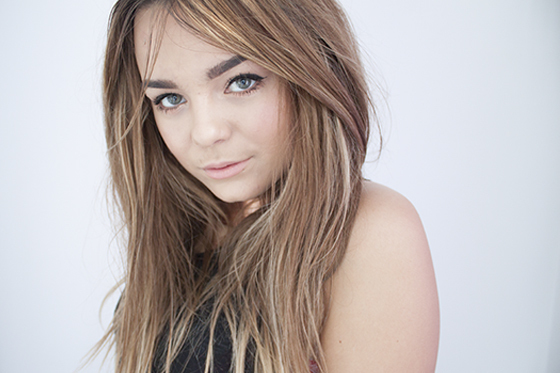 It took me AGES to actually make as I have no idea how to use iMovie! It took a lot of googling and a lot of frustration to get it edited and up but Im pleased with how it came out overall! Still learning though and I'm a perfectionist so it doesn't help! I really wanna find a style for them and stick with it so it will probably change again soon! Anyway I must dash (: Im always so late at the moment! Im not normally one of "those" people either! gorgeous leggins! love the quilted look as well as the rose gold acessories! Ooh I adore those leggings they are so pretty, I haven't seen them before I will have to go and have a peek at them now, they looking like they would be perfect winter! I love your jewelerry in your outfit, I love the gold necklace and the moustache ring is so cute! aaah those leggings are AMAZING! 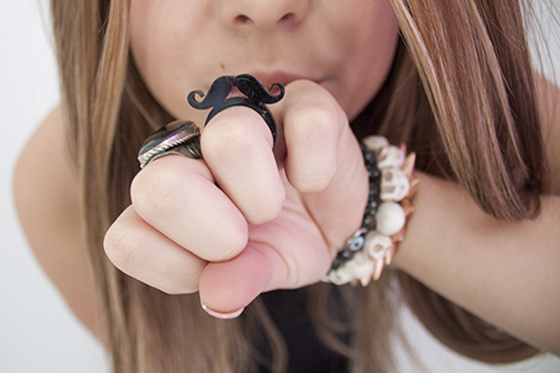 I love your mustache ring ! two of my favourite things, rose gold and velvet! I love the jewelry in this outfit! Velvet leggings actually look pretty cool, and they're probably very warm too. Your sweater looks really comfy and your hair is amazing! Lovely top and the cardigan looks so soft and warm. I really love the video you've made, it all looks gorgeous and it's such a lovely way of showing your outfit. We can definately get a better feel of how the clothes fit and move. So I love the necklace and the leggings, mustache ring and top. And your hair is just gorgeous! Love the leggings but your advertising is a bit in your face these days eek! Gold jewellery is my absolute favourite, although recently I've started to wear a lot more silver rings etc. Loving the leggins s lot! Oh the leggings are lovely! You look cute! Amazing cardigan! v nice! lucky voice karaoke looks so much fun I wanna try it! I love the videos, keep them up makes a nice change. I love these flat forms. Beautiful! I like the leggings loads. Love how most of your outfits are black but you still make them exciting. 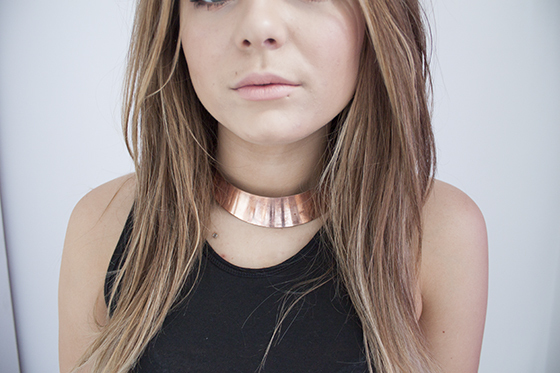 Love the rose gold collar! Girl I love your style!!! Velvet is so wintery and cosy! Love all the accessories you've paired this outfit with too, love a bit of arm candy! Your nails always look great, this ones my fave polish you wear! & straight up just YOU are stunning. Supporting movember with a mustache. I bought a cute rose gold ring from Primark that came with 2 other rings for only £2-£3. you look amazing, love every thing about this outfit, fab fab fab! There's similar flatforms in the office sale just now if anyone wants to know! Ultimate and beautiful ring. It's suitable for her finger.